I first learned to love the awesome power of the trebuchet while playing the excellent RTS game, Age of Empires II: The Age of Kings. 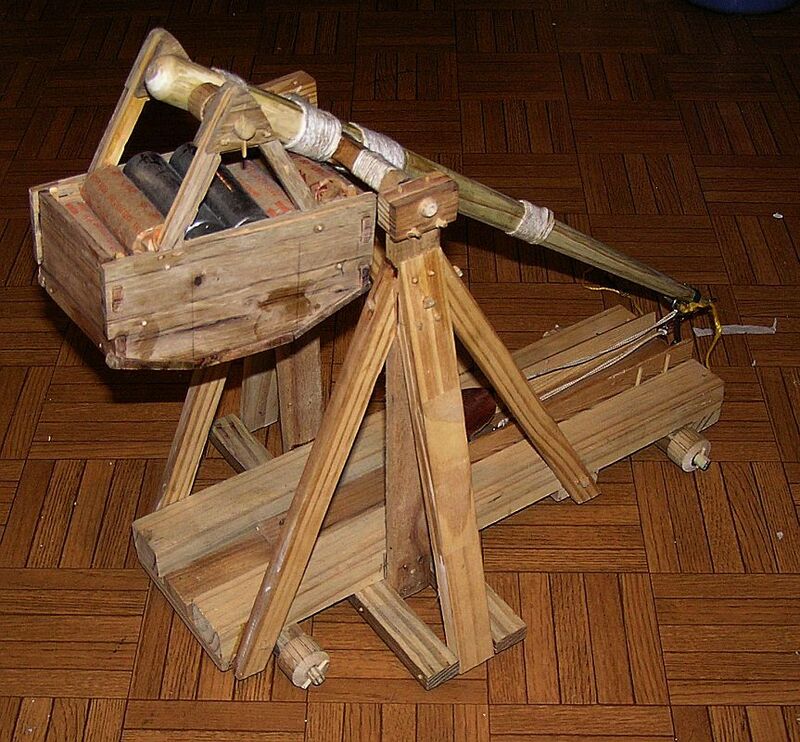 In Age II, the trebuchet was the ultimate incarnation of siege weaponry. With a trebuchet or two, a player could attack an enemy from a great distance, far from danger. It was, by far my favorite unit in the game... and the scourge of all enemy walls, buildings, and armies nearby. As it turns out, the significance of the trebuchet in Age II seems to be entirely in line with its significance in medieval siege warfare. The appearance of this engine, towering on the horizon, must have truly put fear into the hearts of any entrenched defender. Even the stoutest castle walls would have been no match for the sheer destructive force of the stone missiles flung from a large trebuchet. And if having the walls of your castle crumble around you wasn't enough, imagine burning pitch and diseased animal carcasses raining down into your home. Such an awesome concept, had to be further explored...by building my own. This is the tale of the construction of "Scrohammer," chucker of marbles and hurler of nuts and candy! 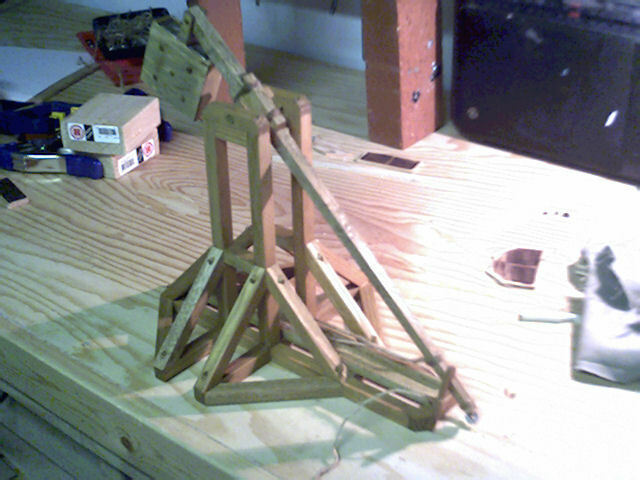 Well, first I did some reading and viewing of some really excellent trebuchet resources. 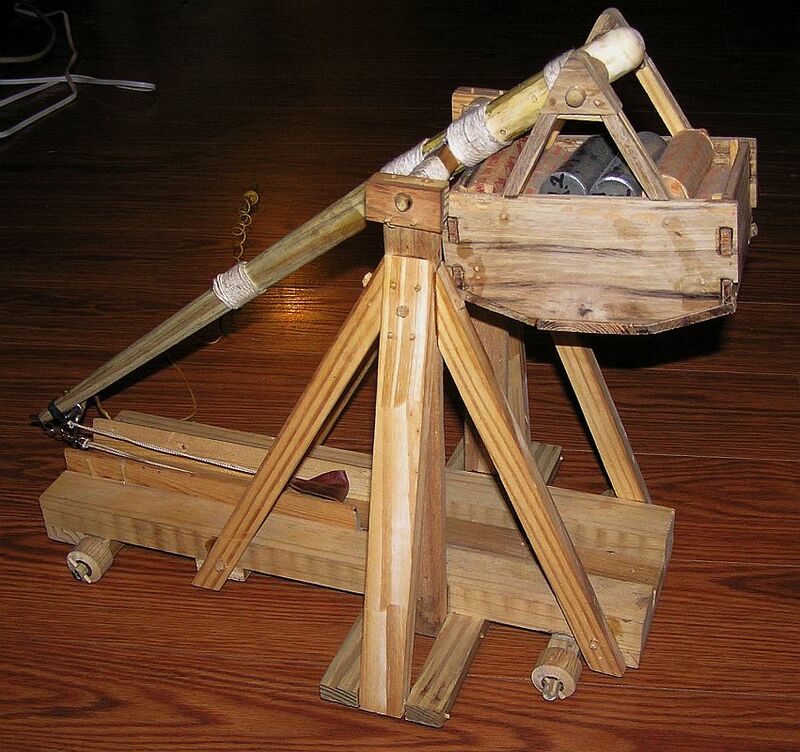 Trebuchet.com - Sells fine trebuchet plans and merchandise. 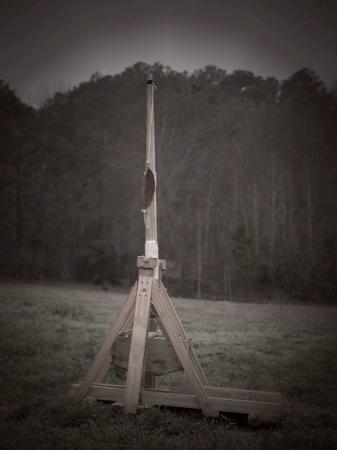 The Grey Company's Trebuchet Page - If you visit only one treb site, make it this one. Excellent scale models, medium-sized trebs and info. NOVA: Medieval Siege - I ended up buying this episode of NOVA on DVD. 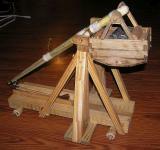 Two life-sized trebuchets are built and tested against a simulated castle wall! 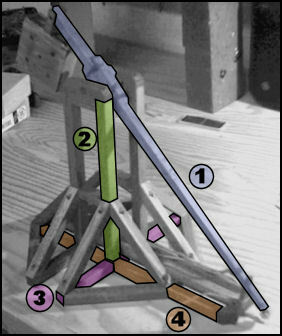 Ripcord's Trebuchet Stuff - An excellent site with plans, pictures, and theory. Having been inspired by these resources, I drew up a whole bunch of rough images for my own design. I wanted it to look good first, and function second. 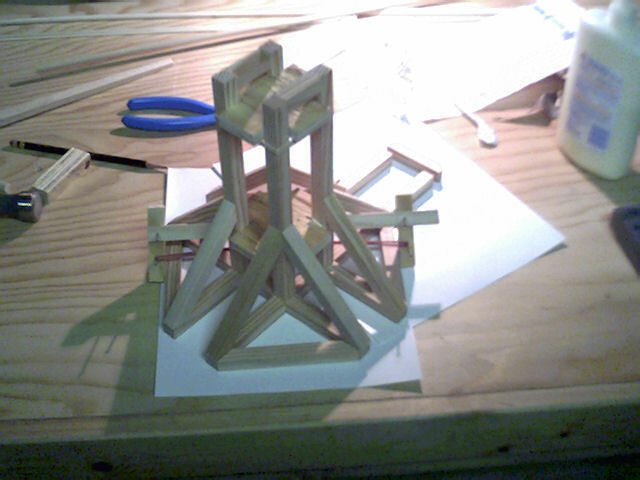 As you may be able to tell, I did get a little inspiration from the Age II trebuchet. I scaled down the throwing beam dimensions from Ripcord's "tennis ball" treb. I made up all of the other details "to look good." This is the main throwing beam. The total length is 16". The distance from the main axle to the throwing end (this is where the sling attaches) is 12". The distance from the main axle to the counterweight axle is 4". The beam is tapered on all four sides so that the counterweight end is roughly twice as thick as the throwing end. This is one of the four uprights. These are each 8" in height. This is one of two side-to-side base beams. These are both 9" in length. This is one of two front-to-back base beams. These are both 11 3/4" in length. These beams run parallel to the sling track. 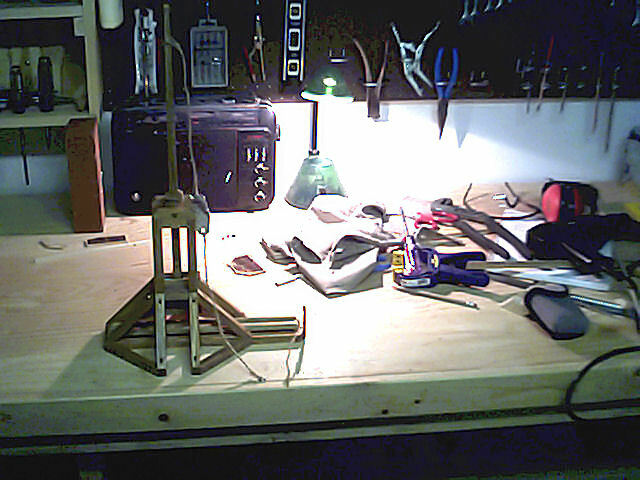 To round up the measurements, the sling and rope come to a total of 10" (give-or-take) when the treb is primed for firing. 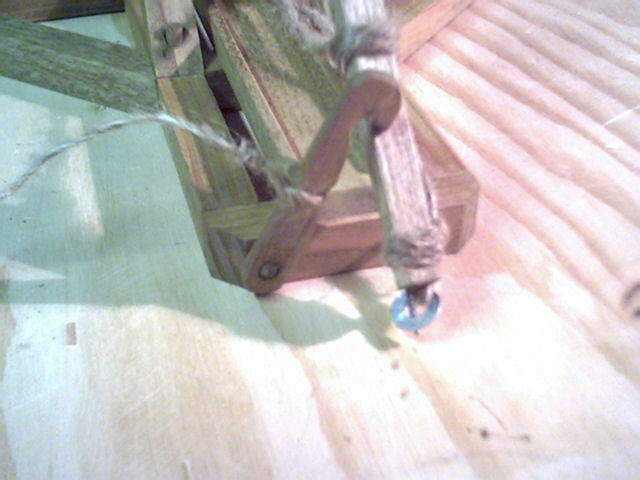 To (hopefully) make this more clear, the total length of sling and rope comes to about 20" when unfolded after firing. I would like to say that I made this model with all authentic medieval construction techniques, but that would be a lie. I used wood glue. The base seems to be a relatively good design and can support a lot of weight. 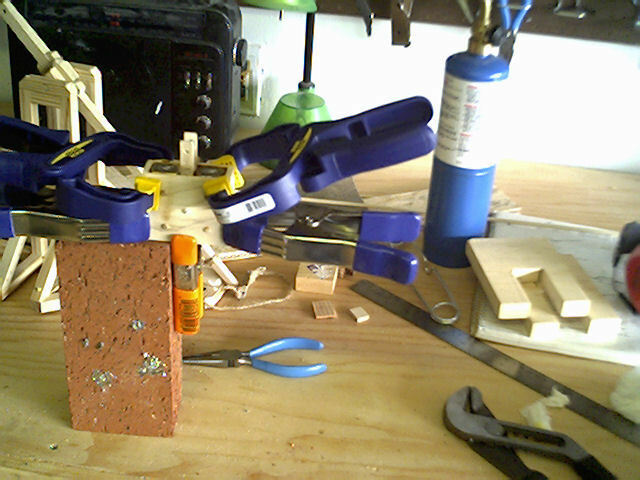 This is my sledge hammer being used to hold some of the final glued pieces. It held a lot of weight. Here is a stack of bricks on the treb base. 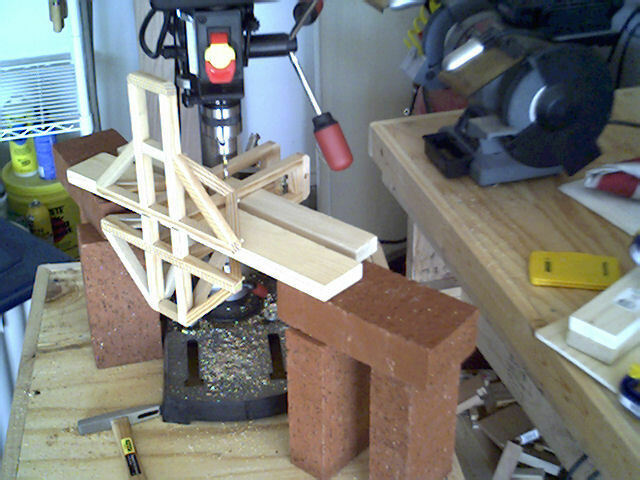 After the base was glued together, I then drilled the holes for all of the dowel joinery. This was time-consuming, but well worth it in the end. 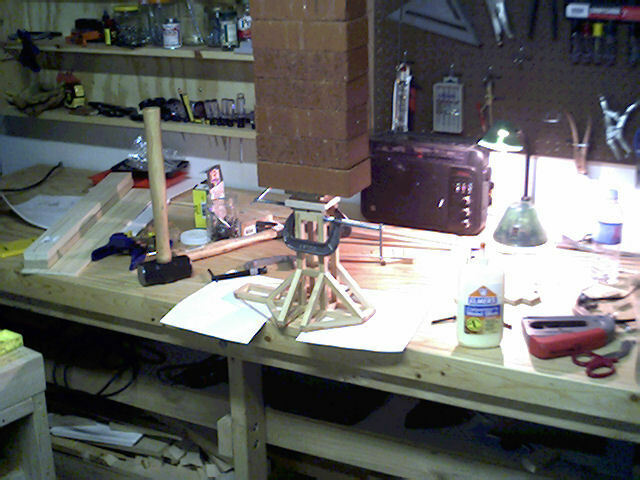 I had a lot of fun making my counterweight. Well, counterweights, actually. You see, my first one wasn't thought out too well. But that's okay, I think the second one looks better anyway. 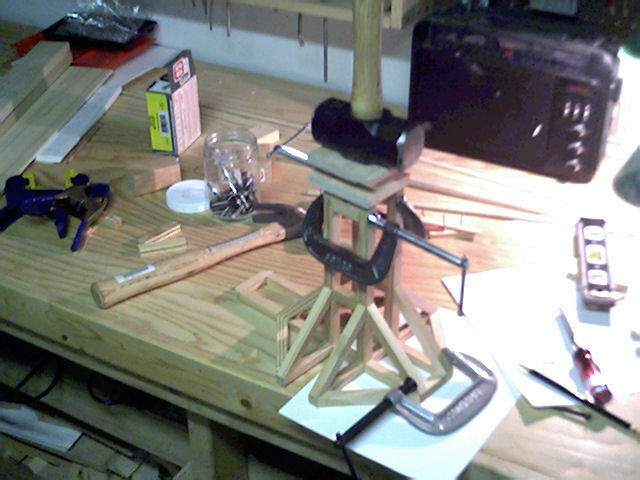 My first counterweight was a simple wooden box with peaked sides. 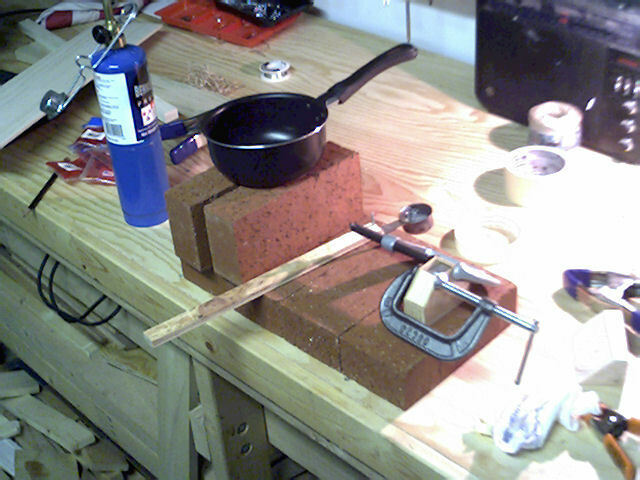 I melted a little over a pound of lead fishing weights in a cheap measuring cup with my propane torch. The liquid lead resembled mercury and poured nicely into the box. The wood was scorched, but did not catch fire. Sadly, when it came time to attach the counterweight to my throwing beam, I found that my plans had not been too well thought-out. I spent the night banging my head on my workbench. On the plus side, I got to see what the layers of poured lead looked like when I broke it apart. 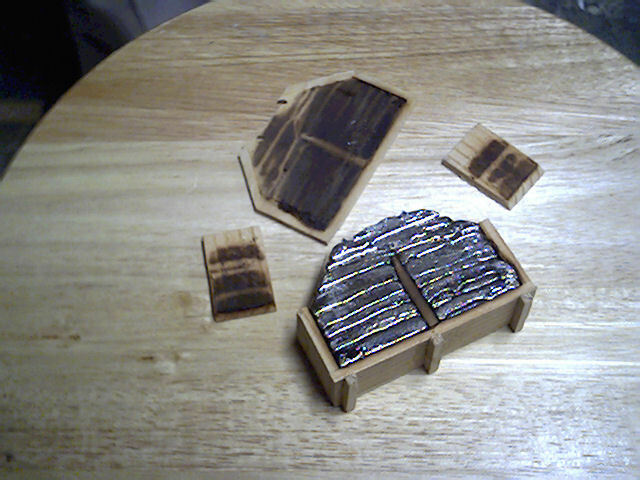 Note the scorched wood. My second counterweight was a little more planned out. This time, I went with a simple rectangular box (2 3/4" wide, 2 1/2" tall, and 1" deep; for those keeping track at home). For strength (and appearance! ), I reinforced the box with dowels. These came in handy when the heat of the lead liquefied my already-set wood glue. I moistened the wood of the box with some handy H2O to be sure the whole thing didn't go up in flames. When I poured the lead into the box (this time in one fell swoop, as I had to re-melt the entire old counterweight), it bubbled and spat as the moisture evaporated. This formed some tiny air-pockets in my counterweight. I know this image is blurry, but you can probably make out the holes where two of the air-pockets collapsed. 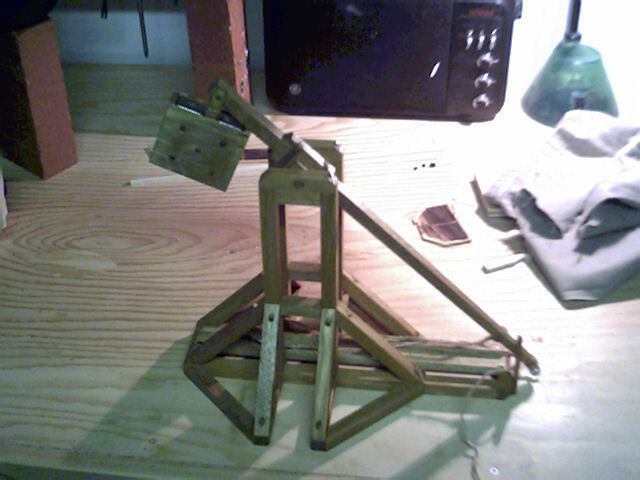 I stained the trebuchet once it was finished. After sitting overnight, it looked great. So, even if it never functioned well, at least I had a nice looking model! A view of the Scrohammer right after staining it. I'm pleased with how it turned out. The images from my old digital camera on the other hand... Well, I can't complain. It was $20 on Ebay. Another view back in the firing position. A close-up of my trigger mechanism. When the twine "rope" is pulled, the wooden hook slips off of the throwing beam, and whooosh! Weird, multi-color image a result of cheapo digital camera. So, does it work? Yes, I am pleased to say that it works as well as it looks. Since the counterweight weighs in at 1lb, 6oz (on a postal scale), the ideal projectile seems to be a standard glass marble (lighter than I would have guessed, at .2oz). That's a weight ratio of 1:110. Scrohammer happily hurls these wee glass spheres of doom a surprising distance of 40 feet. Not bad considering the throwing beam measures just 12" from the axle to the throwing end. That's a ratio of 1:40. I'm pleased with the way this turned out. I'm very tempted to start right away on another one. I think this time I'd like to make a treb that is a little easier to load. Perhaps have the throwing beam off to one side? Who knows. Anyway, until next time, so long kids and happy hurling! Jim writes: "I can really sympathize with plans or details gone amiss. I built this with (mainly for) my sons and we have had a lot of fun with it. We are planning on building a larger one (frame about 4'- 6' high) this summer. 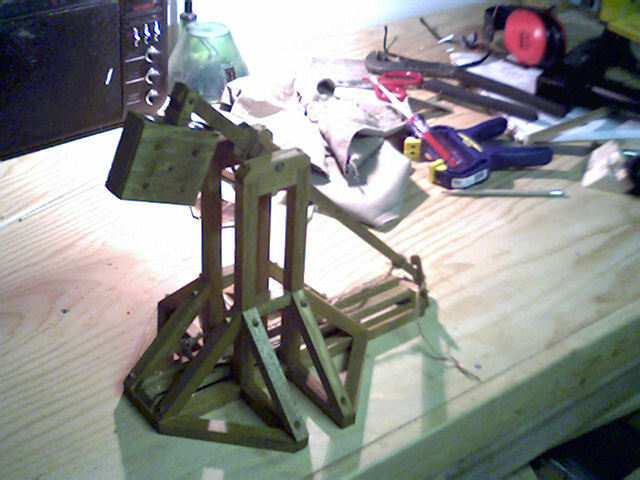 We didn't copy any one design but were largely influenced by PBS's "Warwolf" - that full scale trebuchet built in... Scotland I think it was by Nova." "There's not much more to tell about it so I'll attach some pictures for you. There's an outside chance it may be pictured in Popular Science magazine. 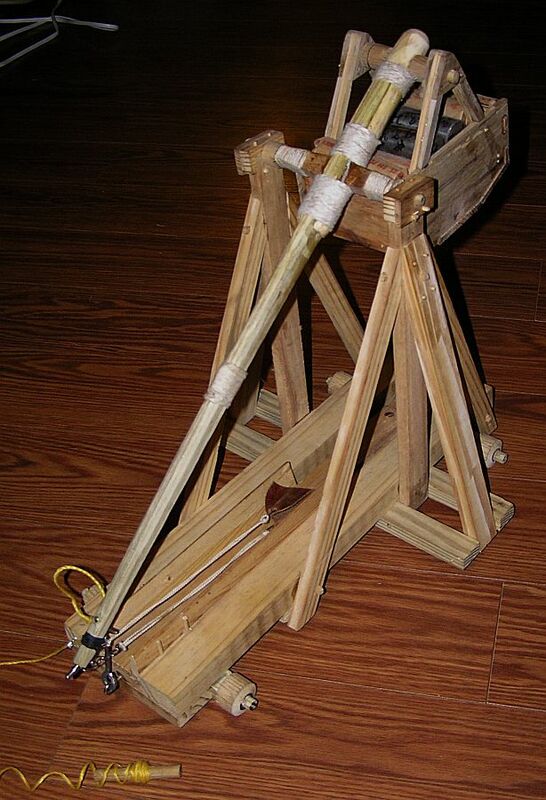 They built a model siege engine in an article a couple months ago and I emailed then much like I posted on your site, with an image. They wrote back asking if they could use it." "Looking at the pictures I have to back up an what I said about building materials. Mostly just pine but the counterweight basket was made out of hickory." "The lashing on the throwing arm is functional. The axle wasn't strong enough and when we drilled through the throwing arm for the bigger axle we had to reinforce it. 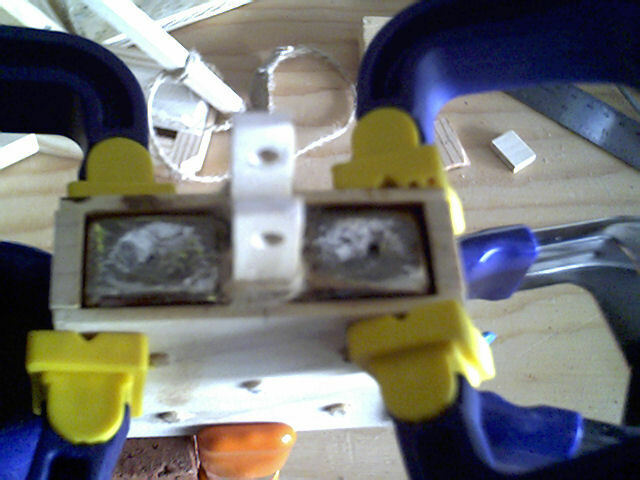 I glued it up but added the lashing for more support though I confess looks was at least a part of it."